It is with great sadness that we learned of the passing of Gilbert Lazard, who was a founding member of the Association pour l’avancement des études iraniennes and its president from 1979 to 1999 (honorary president thereafter). Gilbert Lazard was a French linguist and Iranologist, agrégé de grammaire (1946), whose work focussed on various Iranian languages and on general linguistics. 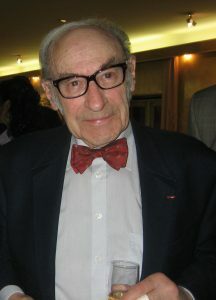 He studied with E. Benveniste et H. Massé in Paris before joining the Institut Français de Recherche en Iran in Tehran. He returned to Paris to take up a position as professor of Iranian languages and civilisations at the INaLCO (1958-1966) before becoming professor of Persian at the University Paris 3 – Sorbonne Nouvelle (1969-1981). He was at the origin of the department of Iranian studies within that institution. In 1972, he was appointed Director of Studies for linguistics and Iranian philology at the EPHE (1972-1990). From 1972 to 1983, he directed the Research Team on Iranian Language, Literature and Culture affiliated with the National Centre of Scientific Research (CNRS). His grammar of contemporary Persian and his Persian-French dictionary became standard reference works, as did his translations of classical Persian poetry. We also have to thank him for the founding of the journal Studia Iranica, to whose editorial board and later scientific committee he belonged for many years. In 1980, he was elected member of the French Academy of Inscriptions and Belles-Lettres (AIBL). He was an inspiration for many — always showing great sympathy and responsiveness; he was extremely generous in sharing his knowledge with generations of colleagues and students. There will be an appreciation of his life in the next issue of Studia Iranica. The president, the editorial board and all members of the Association pour l’avancement des études iraniennes offer their condolences to his wife Madeleine and their children and grandchildren.